The build quality on these are exceptional and they look fantastic too. They have some weight to them given the predominantly metal construction. They really have a premium feel to them. The leather feels firm yet supple and soft to the touch. The buttons sit firmly in place and easily identifiable by touch. I don't really have any issues in this regard. I find them quite comfortable and they fit snugly on my head. I can however see how they may feel uncomfortable on larger heads. They provide just the right amount of clamping force to create a tight seal. The headband does exert some pressure on the crown of my head, but not to the point of being uncomfortable yet. I can't stress enough how important it is to create a tight seal with these. Even the slightest break degrades the sound quality significantly. I have read other users reporting that they do get more comfortable over time. The sound stage on these are amazing. They provide excellent instrument separation. Listening to some Earth Wind and Fire, I am able to distinguish between every instrument. They sound very neutral and warm across the frequency range. Although the bass is smooth and tight, I do however find it a bit too recessed for my liking especially on some pop and r&b tracks. It almost feels as if the headphones have the potential to be punchier in the low end, but they're holding back a bit. Similarly I find the treble could be just a little brighter. The mids on the other hand are where I think these headphones shine. In the instruction manual, B&W recommends about 30 hours of burn in to get to their full potential, so I am hoping they will only improve over time. Can anyone confirm if this is the case? I should also note that I don't notice any lag with these. Watching YouTube videos, everything seems to be in sync with the video. I haven't really played around with the ANC settings much, but can say that they block out about 80-85% of noise without any music playing. I tested this in flight mode with some cabin noise playing from my speakers and could barely hear it. I have never used ANC headphones before, but after playing around with these, I honestly don't see the point of it while listening to music. The headphones without ANC on provide decent passive noise cancellation on their own, and anywhere above 1/4-1/2 volume I am unable to hear anything from the outside environment anyway. In addition I tested the voice pass through feature in office mode at 50% volume and could not hear someone speaking next to me. I do however need to experiment with these features a bit more though, but I do find that the passive noise cancellation works perfectly fine for me. Although I have not experienced any glitches with the wear sensor that other users have reported, I did experience one instance where the music paused while I had the headphones on without reason. This has not repeated itself since and I was unable to replicate it by moving my head and adjusting the headphones on my head. The B&W app is a bit buggy. There were instances where it took forever to detect my headphones and I had to restart the app to detect them. The battery level indicator on the app is also not accurate at all. I fully charged the headphones overnight and the app was reporting the battery level to be at 83%. Out of the box, the headphones came 60% charged according to the app and by yesterday evening it dropped to around 45%, but the yellow light was flashing which supposedly indicates less than 30% charge. Overall, I am quite happy with the purchase. They are pleasing to listen to and I can see myself listening to them for hours without fatigue. Hopefully they will improve over time and with firmware updates. They definitely seem to be opening up with use. The treble is about where I want it to be and the bass is not quite there yet, but it is getting better. I spoke too soon with regard to the wear sensor though Used them for a few hours yesterday and they paused a number of times while listening for no apparent reason. I also noticed that when removing the headphones, the music paused as it should, but then when I put them back on again they resume, however it sometimes skips to the next track instead of resuming the track I was listening to when I took them off. Hopefully these are bugs that can be fixed with firmware updates. So 1 month in and these headphones seem to have really opened up The bass appears more pronounced than before. It's punchier yet still remaining tight and controlled, however they are by no means bass heavy. I am amazed at the amount of detail that comes through. Every single instrument is distinguishable from one another. They sound very balanced across the frequency range with neither frequency dominating the sound stage. Comfort wise, I do feel a bit of pressure on the crown of my head from the headband over longer periods resulting in me having to adjust the headphones slightly every now and then. It's not too bad though. Because of the weight, I am always aware that I am wearing them. There has never been a point where I forgot I was wearing them. So in terms of comfort I guess it boils down to personal preference at the end of the day. I'm sure there are other headphones that are more comfortable. These don't bother me too much though. The issue with the wear sensor seems to have gone away. I'm not sure what could have been causing it at the time as I've not adjusted the sensitivity settings from default at all. The responsiveness of the APP also seems to have improved, although there have not been any firmware updates since. They detect my headphones almost instantly whereas before it used to go into almost an infinite loop trying to detect the headphones for about 30 seconds or until i restarted the app before detecting the headphones. In terms of noise cancellation, I've had a chance to play around with the different levels of ANC. I would say Office mode blocks out around 30% of noise while having little to no impact on sound quality. City mode blocks out maybe 50% and flight mode 75-80%, both of which have a significant impact on SQ. City and Flight mode have a boxed in sort of effect on SQ. I predominantly listen to them with ANC off anyway so ANC is a bonus feature as far as i'm concerned and is merely a feature that's there if i ever need it. There were instances where I had them at around 20% volume in office mode and voice pass-through set to the default setting and I could not hear my landline ringing next to me. The voice pass through feature definitely amplifies my surroundings when there is no music playing though to the point where I can hear muffled conversations in the next room at it's maximum setting. It basically amplifies what my ears would ordinarily hear without headphones on. Battery life is very good. I last charged them 2 weeks ago and I've been using them for maybe an hour or 2 a day at work and around 3 to 4 hours over weekends. They now have 30% charge left in them. 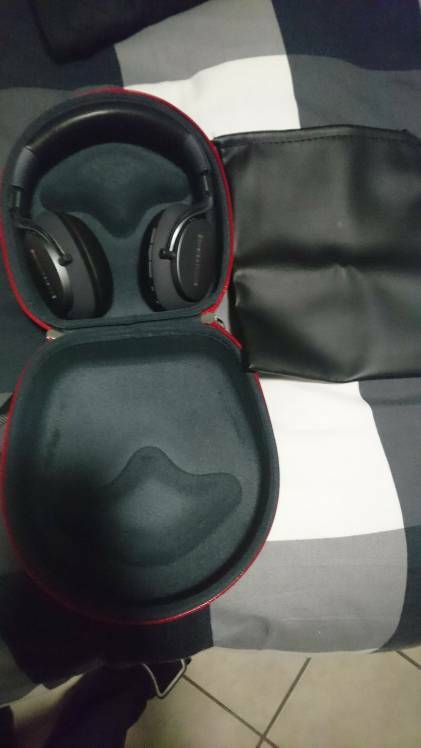 The carrying case that comes with the headphones looks and feels good, however I don't feel like they provide adequate protection for the headphones so I will be looking for an aftermarket hardcase for mines. I keep them in my laptop bag so I am worried that they will get squashed among the contents of my bag. The quality is really good, and it has a kind of soft velour like lining on the inside. Came with a lanyard and leather like bag as well. Although they fit perfectly length and width wise, they're a bit too big in depth for the PX so the headphones rattle around a bit inside the case. Unfortunately it'll be too expensive to return, so if anyone is interested I will put it up for sale. I am looking at getting another case by the same brand in a smaller size. Came across this on Takealot recently. Planning on picking one up soon. W.r.t. my previous post, none of my headphones (incl PX) fit in that case! Probably going to have to order from Amazon soon. A bit late to the party here! Was at the airport in December busy undertaking a 28h journey to visit family for the holidays. During the time at the airport I had the opportunity to demo the PX, Sony’s 1000xm2 and the Bose qc35 ii headphones. I stood in that shop for nearly 3 hours listening to the different headphones and the PX blew me away. I could hear a significant difference between them and the closest to the PX for me was the Sony. I can honestly say that I have been enjoying my PX ever since and they have opened up a bit over the last couple of months. The pads have become a bit softer and creates a better seal. I switch off the environmental filters as well as the wear sensors at home to get the best out of the headphones. During travel i set these to block out just enough noise for me to enjoy the music comfortably. My only worry is the bottom of the headband as the leather is rather soft and it looks as if its cracking however its more of a crease.... i’m concerned that it would actually crack and tear in future. Now looking for opportunities to get better sound out of them.... see my thread. P5 great but on ear unconfortable after a while. Also a PX owner here. I actually found the clamping force of the cans a little too tight no my freakishly large head, so loosened them up by keeping them clamped around a stack of books for a week or so. The best wireless headphones I've ever heard, the only pair to tempt me away from cables! Bought a set from HFX this morning on the way to the airport. Actually went in to chat about the P7’s and left with the PC. Replaced my old Bose QC ‘s. Very happy at this stage . My P3’s will be going to my daughter and my Harman’s to my son. I know have a “all in one “ set. Build quality amazing compared to the Bose QC 35.